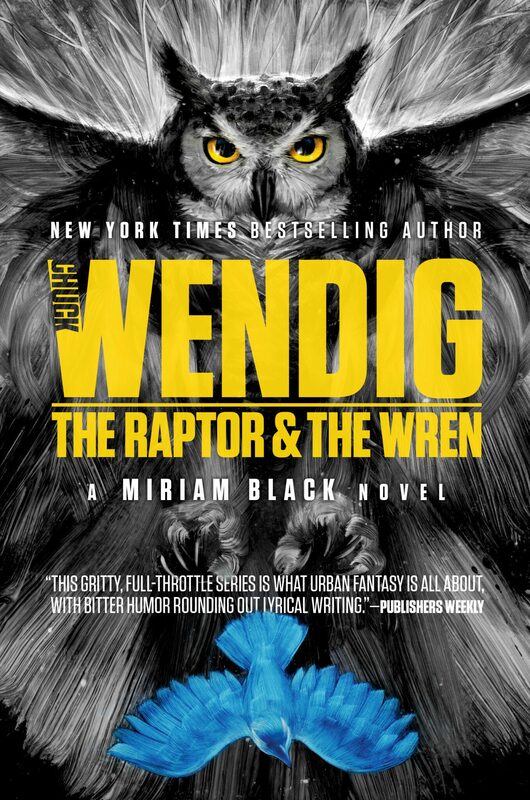 Miriam Black, in lockstep with death, continues on her quest to control her own fate in The Raptor and the Wren, the brand-new fifth book in the Miriam Black series. I wrote this book in the fall of last year, which was, umm, an interesting time politically, and one in which I found myself getting very little sleep, so this book was sort of stolen from and produced by a ongoing fight with insomnia. Not that I recommend it as part of your writing regimen, but honestly, I think that contributed well to the overall vibe of the book. This is a pretty, um, rough book. Like, if you imagine the Miriam Black books to be an entire series of Empire Strikes Back-level downers, then this book is the Empire Strikes Back of that series. It represents a hard row to hoe for poor Miriam, and shows her growing and changing while also grappling with a series of new existential threats for her and those around her. It also contains an owl called BIRD-OF-DOOM, so there’s that. I never know exactly where to put the Miriam books on a genre-scale — some call these urban fantasy, but this book has no “urban” in it, nor is it particularly fantastical, though the supernatural is an everpresent backdrop. It’s a little bit crime, for sure. It’s a little bit horror, most definitely. They’re thrillers, no doubt, supernatural thrillers, written with the kind of (hopefully) relentless pacing where you read it with a breathless pace — the pace of someone being chased through a house by a machete-wielding murderer. Yesterday, as noted, I just finished the sixth and final (!) book, Vultures — which should come out a year from now, roughly. That one is a bit longer than all the others, and it both sad and exhilarating to have finished a six-book series. I won’t spoil what’s to come in that book, because then I’d spoil what’s to come in this book. Beautiful cover, by the way, is from Adam S. Doyle. Anyway. I hope you enjoy it, and the series. If you have enjoyed any of these books, I’d sure love a review written at a site like Amazon or Goodreads, or spraypainted on a city bus, or written in elegant calligraphy on the side of a whale, or burned into the moon using a big laser. Thanks! A note: do not start with this book. You need to read the rest first.